Norwegian singer Solveig Slettahjell began her career on ACT before signing to Universal. 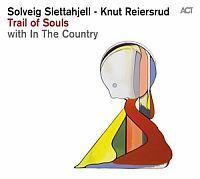 Now she is back in the fold for a gospel/blues album in the company of some fellow countrymen - guitarist Knut Reiersrud (also on harmonica) and avant jazz / indie combo In The Country. Slettahjell's interpretive skills are finely honed and her sedate, seductive delivery proves entirely sympathetic to the source material on this sparse, intimate recording.